The spectacular snowy peaks of Haba Snow Mountain in Shangri-La, Yunnan should be on every wanderlust traveler’s bucket list. Situated opposed the famed Jade Dragon Snow Mountain and above Tiger Leaping Gorge, Haba Snow Mountain means “golden flower” in the language of Naxi, the local ethnic minority. In order to visit Haba Snow Mountain, it is a 3.5-4 hour drive from the Old Town of Lijiang. The drive from the airport to the mountain is incredible however, as it includes the most spectacular journey through the Tiger Leaping Gorge 虎跳峡. I took a last minute trip to Haba Snow Mountain this past March in order to stay at the newly opened accomodation, Clouds Glamping. It was actually a spur of the moment trip, which started with a call from my friend Qiqi asking if I was interested in going glamping. Qiqi is a creative and like me, always interested in new off-the-beaten path experiences (that and she’s also a Michelin-starred pastry chef that whips up some of the best desserts I’ve ever had!). Of course, like the start of all good adventures, I said yes without any prior research and booked a last minute flight to Lijiang, Yunnan. Glamping is relatively a new concept in China so I really didn’t know what to expect, but when I finally met the charismatic owners behind Clouds Glamping, I could see how their vision of hospitality and entrepreneurship was incorporated into every detail of their property. I’ll let the pictures tell the story first because at an elevation of 3000 meters, Clouds Glamping truly felt like a hidden gem above the clouds. Skillet fried pork dumplings that were, for some reason, so amazing we had THREE skillet full of these! Clouds Glamping is run by Yoyo and her husband, both with incredible stories and vision. Yoyo use to be a national baseball player and her idea of good fun is basking in the sun with a coffee in hand. Her husband on the other hand is this comically funny, big heart, big personality type of guy that is always sneaking out to go on hiking trips with us. In the afternoons, we would all sit on the patio to admire the panoramic views of Shangri-la and discuss politics, travel, and what entrepreneurship looks like in remote areas of China. Clouds Glamping is a passion project they have built by hand (most literally) and that is why they so carefully curate all the items they provide for visitors. Whether it’s handpicking Yunnan Arabica coffee beans from a local plantation or choosing speakers that echo nicely in the mountains, the dynamic duo want to craft an unique glamping experience in China. Considering that Qiqi and I are avid food lovers, the farm-to-table concept at Clouds Glamping was the perfect addition to our stay. Even in Shanghai, I’ve always adored Yunnan cuisine for its seasonal delicacies such as foraged wild mushrooms and peppercorn-stuffed chorizo. But what I enjoyed most about dining at Clouds Glamping was the hearty mix of local delicacies and wholesome, Chinese comfort food. The typical breakfast repertoire every day includes coffee, eggs, steamed buns and congee. All the guests tend to dine together in the mornings so I found myself waking up everyday to the smell of delicious creations like scallion pancakes and soft boiled eggs with herbs. Lunch and dinners were free-for-all so you could utilize the kitchen, cook with local produce you pick up from the nearby Naxi village, or go hiking and have a picnic. We went with eating what the locals ate i.e. hanging out with the staff members and eating traditional Yunnan dishes with them. It’s a great way to converse with local villagers and try out the crazy spicy flavors they love! There are things that will inevitably come with staying in the middle of a snow mountain. For one, the temperature drop at night is quite significant so Yoyo would heat up a campfire for us to huddle around and distribute local Shangri-La beers to warm us up. No electricity at night (Clouds Glamping mostly relies on solar power) meant we would all star-gaze and chat before retreating to our tents lit up by small oil lamps. Limited hot water meant we would be more mindful of our water usage and be courteous to everybody. In a way, these inconveniences were charming reminders of the luxuries we take for granted in the big cities we were all from. In short, I am thankful that Qiqi kidnapped me on such an unforgettable trip to Haba Snow Mountain. I was inspired by the people I met, the good food I ate, and the snow-capped mountains of Shangri-La county. There are places you travel to that stay with you for a while. While very much off-the-beaten path, Clouds Glamping was definitely one of those for me. Directions // From Lijiang Sanyi International Airport, rent a car to Haba Village 哈巴村 which is the base of the Snow Mountain, or if you plan to stay in Clouds Glamping they can arrange a car for you to and from the airport for 600RMB/one way. Awesome recap, so beautifully captured :). Would love to visit! Thanks Misha! You definitely have to if you get a chance to visit Yunnan, out of this world beautiful. Now I could camp like that. The food looks amazing! Definitely my type of camping as well! The food was such wholesome comfort food, a great way to try Yunnan local home cooking. Very cool! I’ll have to try this out! Wow! Now this just looks spectacular. This sounds absolutely amazing! 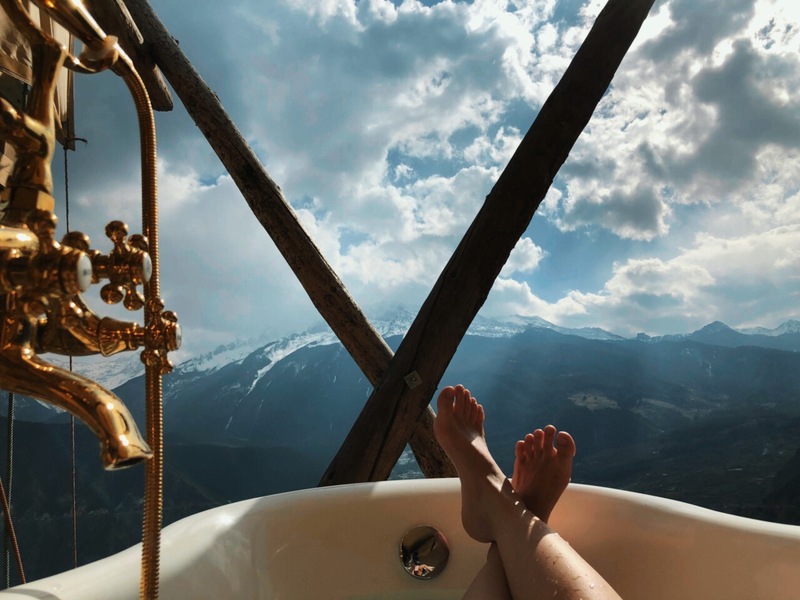 This was my first time hearing about Clouds Glamping and I’m so ready to hop on a plane and go there! What was your most favourite part about the whole experience and was there anything that was challenging? This place will be my next stop of China Trip… Can’t believe still have a piece of heaven on earth.